Pierre Gassendi (1592-1655) was a french philosopher, priest and mathematician. He explained parhelia, measured the speed of sound with some accuracy, became the first person to observe the transit of a planet (Mercury) across the Sun. (Wikipedia). He also corresponded with Galileo and was a strong beliver of Copernican system. The big crater on the right in the image is named after Pierre Gassendi. 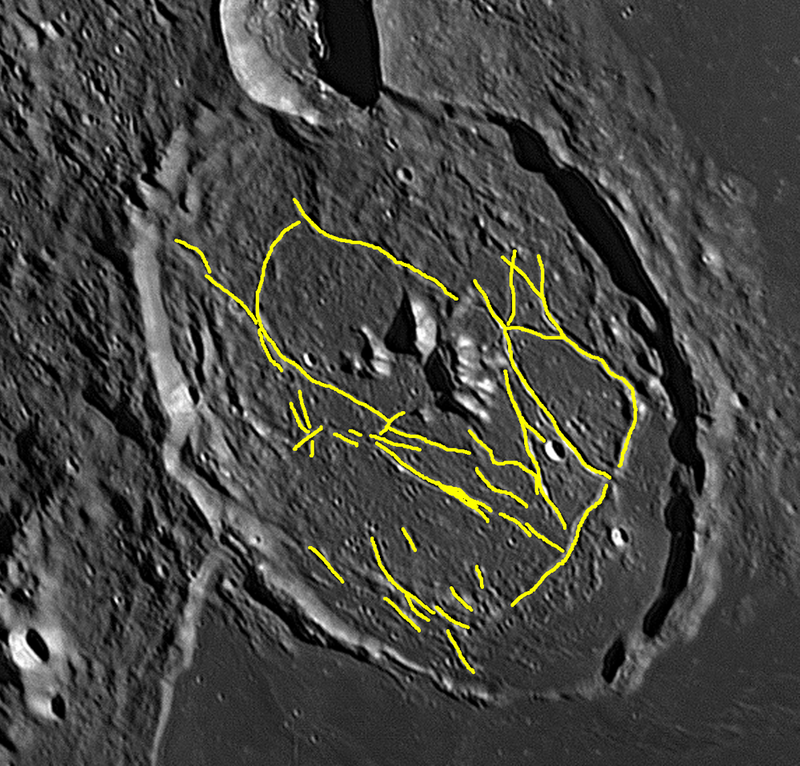 Gassendi crater is located on the western limb of the moon (in the right image, an arrow is pointing to this crater). Right below this crater is Mare Humorum (Sea of Moisture), a 389 km diameter impact basin. A small portion of North-West Rim of the basin of Mare Humorum is visible in the image. Gassendi A is a 32 km sized crater which has impacted on the northern rim of Gassendi crater, which resulted in destroying that part of the rim and raising of the northen floor of Gassendi. Gassendi A was once called Clarkson but IAU does not recognise it with this name. Gassendi B is 25 km wide and seems much older than Gassendi A due to its rounded rim. Also there is a peculiar secondary rim near the eastern rim of Gassendi B, which starts from the base of the bigger rim goes straight down to South for 77 km and then terminates. But it seems a faint one going towards SouthWest side. Now coming back to the star of the show, the main crater Gassendi. It seems a bit oval in shape but that is due to its placement on the moon where moon's spherical shape changes the viewing angle from circle to an oval. Compare this picture with the image from LRO lunar orbiter which shows its true circular shape. Gassendi is an old crater, estimated to be around 4 billion years old. Although the floor of the crater is all fragmented but it seems that it was flooded, probably from the Mare Humorum. There are many central peaks in the center and the highest is 1.2 km tall. The walls of the crater seems intact everywhere so perhaps the lave came under the walls? Mare Humorum seems to be the source of this lava. Note the southern part of Gassendi, where Mare is located, is distinctly smoother than the rest of the crater floor. Also the Southern most rim is also the weakest part of the entire rim. Other parts of the rim have no terrace structure which is easily visible in other big craters such as Copernicus. This is probably because of the moon quakes or the impacts near Gassendi, specially Gassendi A, that the terraces have disappeared form the rims. 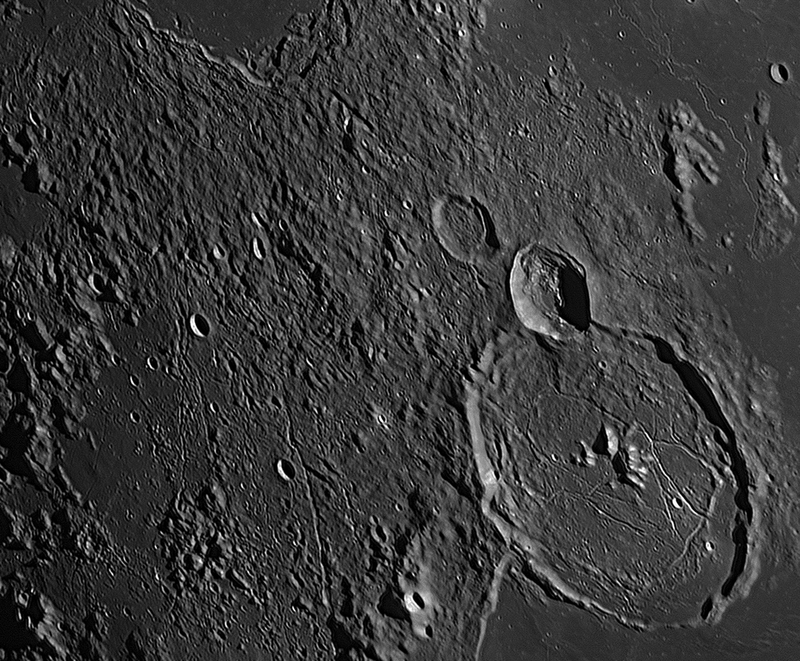 Gassendi has probably the most complex rille (narrow channel) structure of all the craters we can see on the moon. A huge contrast is Plato. I have drawn some rough lines of this rille pattern in yellow so it can be seen a bit easier. These rilles are probably a few hundred meters deep. These rilles are believed to be formed by the collapsed lava tubes or extinct lava channels. A lot was once happening at Gassendi! Another interesting area is this crater to the west of Gassendi. This crater has a marked bright ejecta in its surroundings. The crater is 2.5 km wide and the ejecta is more than 10 km wide. North West area of Gassendi is very uneven and has various smaller craters. Gassendi was once a potential target for Apollo 17 mission because it can offer highlands as well as the material from the Mare. But it was too difficult to move around so they went to Taurus-Littrow Valley. Gassendi is also very famous for a rare phenomenon noticed by avid lunar observers, called Transient Lunar Phenomenon (TLP). They report a sudden brightness of light and color in and around Gassendi. Processing: Stacked 2,000 frames from 25,000.